San Bernardino, Calif. – July 19, 2011 – Rounds 9 and 10 of the 2011 Lucas Oil Off Road Racing Series return to Glen Helen Raceway this August as part of an exciting double-header weekend of racing and family fun. As one of the premier off-road racing series, the Lucas Oil Off Road Racing Series brings together some of the best drivers in the country – from Supercross star Jeremy McGrath to off-road legend Carl Renezeder – and pits them against each other on the best tracks in the Southwest. A combination of off-road racing and motocross, the Lucas Oil Off Road Racing Series brings top notch off road racing action right to Southern California. Gates open at 3PM on both Saturday and Sunday, with the racing getting underway at 7PM. In addition to great racing, there will be a number of fun activities for the entire family, including concerts, giveaways, and more. 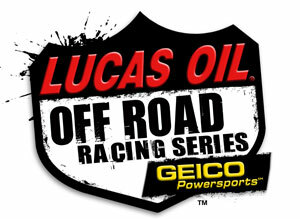 Tickets for rounds 9 and 10 of the Lucas Oil Off Road Series can be purchased online at http://lucasoil.showclix.com/. Single-day tickets for Saturday and Sunday are $30 for adults and $10 for children ages 6-12 (children under six are free). Weekend passes are $50 for adults and $15 for children 6-12, giving fans the ultimate off road experience. Weekend passes include Friday’s practice and qualifying heats, as well as Saturday and Sunday’s races. For more information on the Lucas Oil Off Road Racing Series, including results, class information, driver bios and a complete schedule for the weekend’s racing, go to www.lucasoiloffroad.com. You can also follow them on facebook at http://www.facebook.com/pages/Lucas-Oil-Off-Road-Racing-Series/79918439092, or on twitter at http://twitter.com/LOORRS.